Suspend the betting, close the books, and notify the engraver: I’ve just seen what will surely be this year’s Best Picture winner, and it’s 12 Years a Slave. There’s no question in my mind that this will be our ultimate awards season victor, and the fact that there’s still any room for debate at all means that Oscar bloggers were high on more than mountain air last week at the Telluride Film Festival, where the film first sneaked before tonight’s official Toronto Film Festival premiere. In fact, I’ll go one further … no, two further: Not only will 12 Years triumph in the Best Picture category, but I’d put my money on a historic Best Director win for Steve McQueen, and I’d mark Chiwetel Ejiofor as the frontrunner for Best Actor. Like, what’s gonna beat this movie? Freakin’ Monuments Men? To bring you up to speed — though if you’re unfamiliar with 12 Years a Slave, that won’t last long — the fact-based film stars Ejiofor as Solomon Northup, a free violinist living in 1841 New York who is drugged by two shady employers (one of whom, randomly, is Saturday Night Live’s Taran Killam), then kidnapped from his family, transported to Louisiana, and sold into slavery. 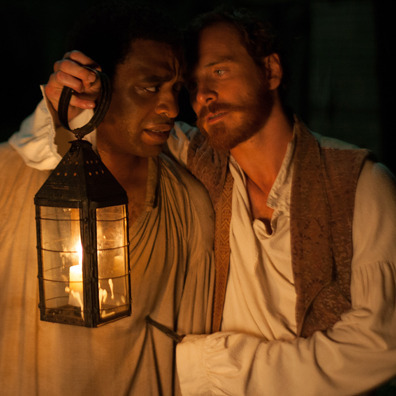 Renamed Platt, the badly beaten Northup struggles to sublimate his personality in order to survive, a task that is already dehumanizing but becomes downright untenable when he is sold to the sadistic plantation owner Edwin Epps (played by Michael Fassbender, who previously starred for McQueen in Hunger and Shame). I expect the Academy will agree with her. There are still many movies yet to screen here at Toronto — August: Osage County, based on the Pulitzer Prize-winning play, could be a contender — and Oscar blogger Jeff Wells told me he thinks that David O. Russell is due for an Academy Award and that the forthcoming American Hustle could be his ticket. But could even the best versions of those movies feel seminal the same way 12 Years a Slave immediately does? There hasn’t been a filmed project that engages this galvanically with the subject of slavery since the television miniseries Roots; yes, we got Django Unchained last year, but compared to the hard truths of 12 Years, that jape-filled Best Picture nominee is from another dimension. It helps, too, that the movie is an across-the-board formal triumph. McQueen makes not a single misstep with the camera, many of the actors are turning in career-best work (or, in the case of surefire Supporting Actress nominee Lupita Nyong’o as a sympathetic fellow slave, building a career on the spot), and behind-the-scenes contributions from writer John Ridley and composer Hans Zimmer are simply sterling. Should another film come along that’s capable of equaling 12 Years a Slave, I’d be happy for my awards predictions to be proven wrong, but let’s get real: That isn’t going to happen. It’s the capstone to a remarkable year for black cinema that also includes success stories Fruitvale Station and The Butler, and it could reign supreme in a night destined to make Oscar history, especially if McQueen becomes the first black filmmaker to take home Best Director. As I sat in the bar with that shattered writer tonight and we struggled to speak, I said, “A century from now, when they put together a montage about the history of movies? They’ll put the film we just saw in the first ten seconds of that montage.” He didn’t even question it; he just nodded, a lump rising in his throat. Normally, I’d feel like I was sticking my neck out to engage in that sort of hyperbole, but this is as easy a call as I’ve ever made. Beat that, kids.